Executive style capped roller ball or fountain pen with unique four sided barrel and spring loaded clip. The roller ball is equipped with a standard international refill with black ink. 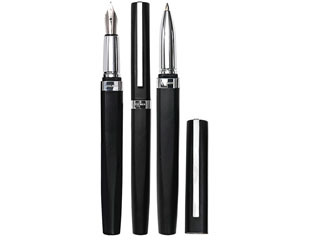 The fountain pen is equipped with an iridium nib, medium point. Available in black matte finish with polished chrome accents. Laser engraving in shiny silver & standard black triangular box included.